In response to a note I sent via his publishers, Oliver Postgate once rang me: the voice of the Clangers and Bagpuss filled my ears. Something similar happened in this glorious survey of Edward Bawden’s landscapes and Second World War portraits, posters and book jackets. Even the unfamiliar works feel like old friends. His design work is puckish, playful, quirky, while his paintings share the exuberant lightness of his friend Eric Ravilious, but with a rural English sensibility all their own. 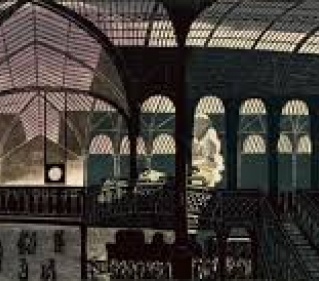 His evocation of Liverpool Street is a poem of iron girders and remembered soot. You get to know the man through his art, and to like him. It’s a curate’s oeuf, this bilingual Anglo-French production of Moliere’s comedy, relocated by playwright Christopher Hampton and director Gerald Garutti to present-day LA. Paul ‘Peaky Blinders’ is a cultish, tattooed Tartuffe full of southern menace – a big performance but not a resonant one. Spiral’s Audrey Fleurot exuxes statuesque Gallic hauteur as Elmire, while the gullibility of Sebastian Roche’s Orgon, is – as so often with this play – inexplicable. It’s staged around a luminous neon cube with no sense of place of unifying style, let alone language, and with awkward references to Trump jammed in. Who thought this was what the West End wanted? Tom Lubbock once noted that Brancusi put fun and naughtiness back into the po-faced art world and Korean artist Lee Bul may fulfil the same function. Although there is high seriousness in her work (videos of performance works about abortion) one can’t help but smile at her dangling bladder-like forms, futuristic utopias and bulbous cyborg ceramics. 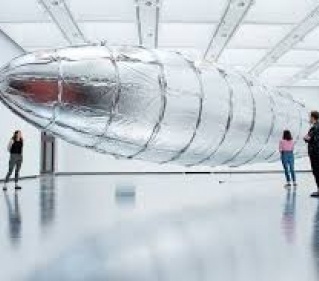 Her tinfoil zeppelin is a thing of buoyant beauty. The day after the press view one artwork partially made of dead fish had to be removed and another caught fire, closing the gallery: how’s that for adding to the gaiety of the nation? Michelle Terry confidently stamps her imprimatur on the Globe in two clear and simple, gender-blind productions, performed by an ensemble of six men and six women, one of whom – Deaf actor Nadia Nadarajah – communicates and is communicated with in sign language. This brilliantly expressive dimension works better in As You Like It where Nadarajah’s Celia is thick as thieves with Jack Laskey’s Rosalind, in a staging suffused with bittersweet yearning. The gender switch for some characters quickly seem the most natural thing in the world. Terry plays bit parts here, including old Adam, keeping her powder dry to deliver a damaged, capricious Danish Prince in a Hamlet stronger on domestic and family relations than on regal or supernatural atmosphere. I’ve rarely felt Hamlet’s love for his father more powerfully; the soliloquies are strong; the sudden starts of Hamlet’s rages and madness stronger. Here, the cross-casting illuminates clearly how Hamlet and Laertes demand to be heard, and how Ophelia is only listened to once she is deranged and doomed. Altogether, the show feels less coherent. 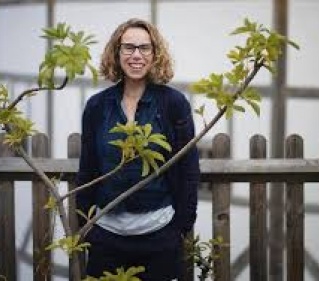 The directors of both plays are Federay Holmes and Elle White, names new to me, but the vision is clearly Terry’s, and mark a decisive and intriguing start to her tenure. Usually art that’s about art annoys me, but John Logan’s play is an exception. 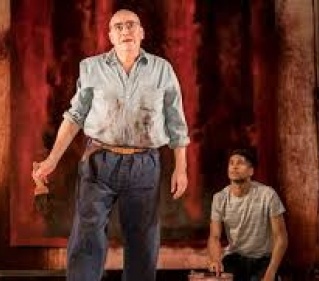 Director Michael Grandage and actor Alfred Molina have intriguingly revisited a work they first explored in 2009 - a portrait of the obstreperous Abstract Expressionist Mark Rothko, yanking his russet Seagram murals out of his heart and soul, aided and irked by a young assistant (Alfred Enoch). It’s a passionate, sometimes discursive, discussion about what art means and why it matters, in which death – both figurative and literal – looms large. Molina gives a great, pugnacious, powerhouse of a performance and Enoch makes a springy foil. And it’s artfully, economically done by Grandage.